What is it? A clicky stealth game about stealing art and avoiding burly guards. The Marvellous Miss Take is an efficient, adept stealth game, and I appreciate how effectively it creates challenging situations from simple systems. Even so, in the past week I’ve spent plodding through it I’ve found it stressful more often than enjoyable. 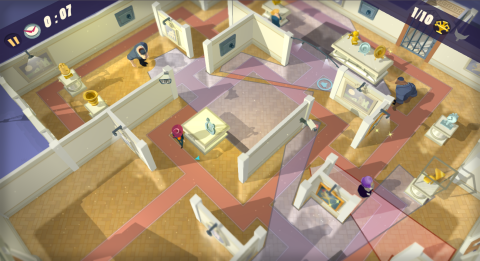 As one part of a trio of art thieves, the goal in each level is to slink through two floors of a gallery (viewed from above) stealing paintings and statues. Stealthiness is expressed simply: Guards have the genre’s typical poor peripheral vision, and can only see what’s in a blue triangle in front of them. If they spot you, they’ll become alarmed and investigate. If you stay within their field of vision for too long, they’ll charge and capture you. To succeed, you have to become a poltergeist, letting the guards see and hear you just enough to lure them away from your path, but never so much that they recognize you. You can whistle or cough to attract them, run to make noise and move quickly (a primary function of running in the real world as well), let them spot you and investigate, and occasionally use tools such as a noisemaker or teleporter. There are other obstacles, such as swiveling security cameras, dogs that follow your scent, and lasers, but it’s mostly familiar stealth stuff. What’s a bit atypical is that the guards aren’t automatons who march in short, predictable loops. These guys are aware that thieves tend not to be standing in only one of two directions, which is revelatory for video game guards. Some of the guards stand still, but others wander around good portions of the level, which makes for a lot of quick thinking. My quick thinking, though, is pretty much limited to “I will hide over there now.” There’s not a lot to figure out in The Marvellous Miss Take, aside from the sometimes-annoying pathfinding. The default control scheme has me clicking on a destination to walk, and holding down the mouse button to run. It mostly works, but it’s occasionally frustrating when my character gets caught going around an obstacle in a direction I didn’t intend. It’s also frustrating how much I have to rely on the randomness of the guards' paths, which isn’t a reliable thing to rely on, and isn’t very fun to rely on. They’re the most interesting thing about The Marvellous Miss Take, but fooling them is hardly the most important skill: my success feels much more like the result of slow, careful movements and luck rather than tricky diversions. The in-game hints urge me to use my powers of distraction rather than waiting for the guards to move, and I definitely used them successfully, but they just aren't powerful enough to be reliable. If I whistle to attract a guard, for instance, I have to be pretty close to him. Then I need to make sure there's a wall I can duck around so he doesn't see me, and after that I only have a few seconds while he's distracted to do what I need to do. Once he's done being alerted, there's a decent chance he'll just turn right back around. So, what did I accomplish that I wouldn't have accomplished by walking behind him? The most fun I had was when I beat levels recklessly, leading the guards on a Benny Hill chase. The most fun I had was when I beat levels recklessly, leading the guards on a Benny Hill chase before popping through the exit in the nick of time. But playing like that becomes difficult early on when security cameras are introduced, and even more difficult when lasers are introduced. At that point, it just becomes tedious—failing because I ran into some dumb bystander who slowed me down and caused me to trip a laser alarm. Rather than lots of experimenting with the guards' AI and positioning, Miss Take increases the difficulty with traps that take advantage of an imprecise movement system. The art also contributed to how quickly I tired of Miss Take. I love the style and it looks great (especially with supersampling on), but the 25 levels are so visually similar that they blend together. If it didn’t require so much attention, I’d say that The Marvellous Miss Take would make a great game to casually poke at while half-watching a bad TV show. As it is, it’s not interesting enough that I want to sit at my desk and devote my full attention to it for any longer than I have. I do respect how clean and direct its design is, and how it tries to make stealth an active task instead of a bunch of waiting, but it only succeeds at that in a portion of its levels. It's not bad by any means, just a decent stealth game that didn't hook me. The most interesting character has to steal keys, then open safes which set off alarms. Security cameras can be tricky to navigate around. Some levels include tools, like this noisemaker which distracts guards. The levels are represented by paintings in your gallery. Lasers are just the worst.